Figure Eight Island wants to have your cake and eat it too. While pursuing a terminal groin injury on the North Carolina coast, full steam ahead, the Islanders have been slow paddling a beach renourishment project that might scuttle the groin proposal if implemented too fast according to coastal observers. The consultants are in the fact finding mode for the project based on direction from the Project Delivery Team. The preliminary draft of the EIS document will probably not be released until ’09. Sandbagging is a temporary measure, protecting several Figure Eight houses, that actually increases beach erosion in front of the sandbags, hence the need for active beach renourishment to complement it. In fact marine charts show a steep drop in the sea floor immediately in front of the area being sandbagged. Indeed one irony of the terminal groin at Fort Macon being used as an example is that beach renourishment is still required and that without it the groin would be a failure. Click to see the shifting sands of Rich Inlet at Figure Eight Island over time. New construction of houses requires setbacks of 30 times the erosion rate or a minimum of 60 feet. All new structures over 5,000 square feet in area require setbacks of 60 times the erosion rate or a minimum of 120 feet. A current rules change proposal would actually toughen this requirement. There are over 50 houses on Figure Eight Island that exceed 5,000 in area. One of those houses was the scene of the recent controversial private party attended by members of the 21st Century Transportation Committee, a possible violation of open meetings laws. One spirited defense of Committee members I heard since was that the party was attended by 150 movers and shakers, moving and shaking to flamenco music, and that the chance of 3 members being in the same place at the same time discussing state business was remote. Comments made the next day at the official meeting in Wilmington exposed that fallacy. 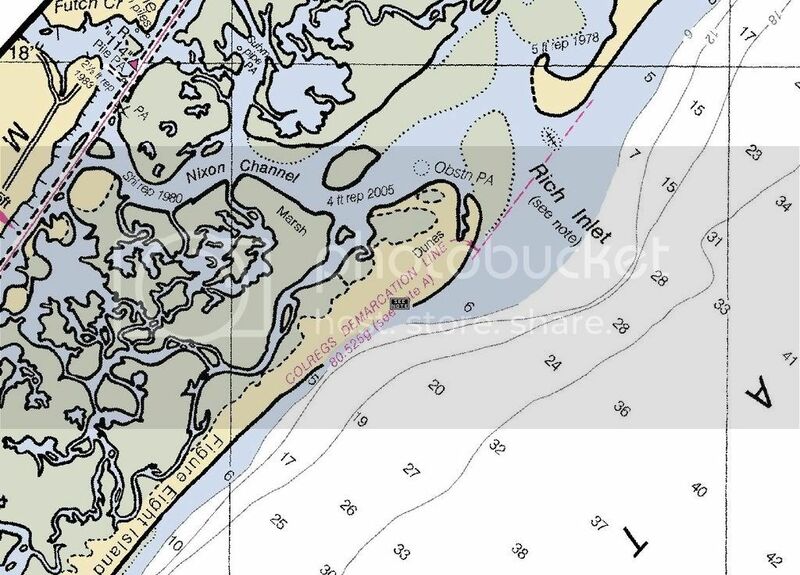 One thing is sure: Figure Eight Island is pulling out all the stops to privately facilitate public protection of private property while the public and neighboring property owners are left in Rich Inlet without a paddle. Great post, Greg. The question of the wealthy elite end-running environmental regulations and standards … fueled by public dollars … should be put to every candidate running for any statewide office. There is no obvious pattern to owner political contributions other than big one to Mike Easley and Marc Basnight. Here’s some background from a November Charlotte Observer story. One contributor stands out: V. Parker Overton of Overtons water sports retail fame. He and his wife are big contributors to Easley and Basnight. Their house appears to be the most endangered being closest to the ocean with sandbags protecting it just 25 feet away. The house is also over 5,000 square feet in area and if built new would require a 120 foot setback. The Gore family was nearing the end of a 12-day vacation at a private home on the island, said Thomas F. Taft, a family friend who planned the trip. The private home, where the Gores also stayed for two weeks in 1997, is owned by V. Parker Overton, founder of a large water sports equipment retailer. Mr. Gore had intended to stay until Tuesday, but after monitoring the hurricane’s progress on television and through military channels, decided to leave early, Mr. Taft said. So when Al Gore comes to the beach he stays in the house on Figure Eight Island voted most likely to fall into the ocean. Thomas F Taft is a member of the board of trustees of the Southern Environmental Law Center. His wife is an Associate Professor of environmental science at ECU. Don’t these people ever talk to each other? One of the contributions made by the “Island Preservation Society” PAC was $500 to Thomas Wright 10/10/06, a sum which was never reported by Wright. The Progressive Pulse – What Would Al Gore Do? New construction of houses requires setbacks of 30 times the erosion rate or a?Touch Screen LCD Monitor? minimum of 60 feet. All new structures over 5,000 square feet in area require setbacks of 60 times the erosion rate or a minimum of 120 feet. A current rules change proposal would actually toughen this requirement. There are over 50 houses on Figure Touch Screen Monitor? ?Eight Island that exceed 5,000 in area. One of those houses was the scene of the recent controversial private party attended by members of the 21st Century Transportation Committee, a possible violation of open meetings laws. very cool article ,thanks for sharing the article!like my cool stuff .very useful. Think about it.Latex glove equipment Call it $4 on the glum side over an espresso,plastic bag making machinery most places. It obligatoriness reproduce higher. Their house appears to be wedding dress the most endangered being closest to the ocean with sandbags protecting it just 25 feet away. The house is also over 5,000 square wholesale soccer jersey feet in area and if built new would require a 120 foot setback.